Into the Woods › What should we do about too many deer? What should we do about too many deer? Why are there too many deer in the suburbs? It’s not just because there are too few natural predators and because it’s dangerous for hunters to shoot deer in the suburbs. It’s also because there’s more for deer to eat in the suburbs. In an old-growth forest, there’s very little new growth for deer to eat. Logging creates a feast for deer, because the sunlight can reach the ground and all kinds of new growth springs up. If you cut down the woods to make new suburbs, the deer love it. 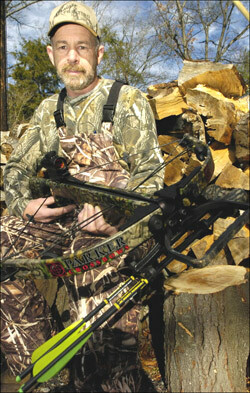 The Winston-Salem Journal has a story this morning on hunters using bows, including crossbows, to hunt deer in Elkin. Sorry, but it’s difficult to post links to stories in the Winston-Salem Journal because the Journal has a primitive web site without a decent system for permalinks. The fact missing from the Journal’s story is that suburbanization causes the deer population to grow, because suburbanization clears ground for deer’s favorite foods. As for what we should do about deer overpopulation, other than to stop building suburbs, I don’t know. Deer overpopulation certainly is real. Feasting by the fauna is very hard on the flora, and we need all the flora we can get these days. After I’m situated in Stokes County, I hope to understand the deer situation better. This was written by daltoni. Posted on Sunday, January 13, 2008, at 8:45 am. Filed under Sustainable living. Bookmark the permalink. Follow comments here with the RSS feed. Post a comment or leave a trackback.